Reach your audience anywhere they go with the power of mobile advertising. Each Bobit website has a full mobile website (which is essentially a separate website with the same content as the desktop sites, simply designed for optimal mobile browsing). With mobile, you can create a succinct message, enable social-sharing, and drive users directly to your site or a special offer. Mobile advertising offers a cost-effective platform that builds brand awareness and drives traffic to your website. 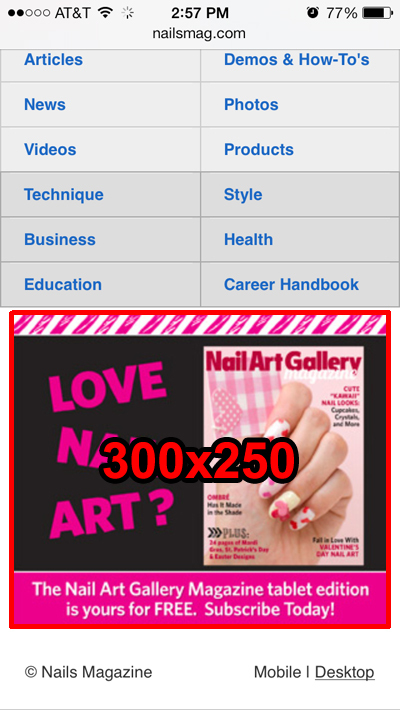 Limit copy to 10-15 characters on 320x50ads and 24 characters on 300×250 ads. Don’t use Flash or animation. Link to another mobile-optimized site (when a user clicks on a mobile ad, they’re expecting to continue the “mobile experience”). Make it clear what action you want a user to take when they see your ad. Many users simply want to read or scan a message on mobile, not type in a lot, so if you are asking for information, keep it to a minimum.